I had not long before purchased a beautiful Skyfox Gazelle aircraft from Boonah Queensland airport and I was very proud of the beautiful machine, bright yellow and very clean. It made such a lovely sight in the sky. I had done my solo flight in northern NSW but was relocating to Wyndham in Western Australia’s Kimberley region, the most northerly town in WA with splendid scenery, big rivers and close to the ocean. How would I have my beautiful aircraft transported to WA? 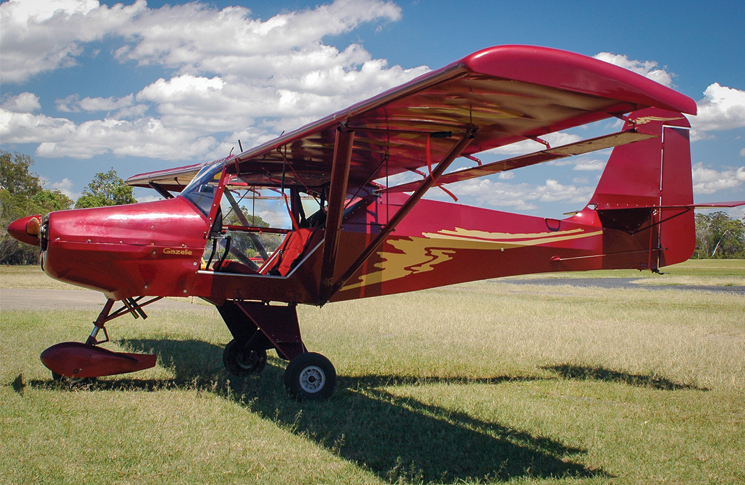 I got help from a chief flying instructor (CFI) whom I got to know, called Norm, who was living in Narromine NSW. He agreed to help me and met me at Boonah airport. We departed in beautiful weather, me sitting in the left seat and Norm flying the Gazelle from the right seat. We flew VFR with the help of an added GPS. I learned on the way and Norm made me say some of the inflight checks; I remember one of his peculiar downwind checks was ‘have we got wheels?’. Of course this was important, but I would not have included that. We had a good trip over, quite a few stops on the way and about 28 flying hours. Once in Wyndham, Norm stayed in a motel and for the next few days gave me flying instruction. I passed all my endorsements and got my full pilot’s certificate on 20 June. After Norm departed I was happy to practise, took a few passengers and honed my flying skills. I was especially proud that I achieved very good landings all the time. Now it was time to go a bit further and a trip to Kununurra, 60 miles south, was planned. The morning was beautiful, very light wind, so I did my pre-flight checks. A quick check of my fuel levels revealed that I should have enough for the short trip, but did I have enough reserves? I departed smoothly, there was no other traffic, and as Kununurra has the same north-south runway directions as Wyndham, I decided I would do a straight-in approach, i.e. you don’t fly normal circuit procedure, but you get in straight final. The trip to Kununurra is straight forward—you more or less follow the highway, go between two high rocky peaks and in no time the runway is lined up in front of you. About three-quarters of the way to Kununurra I thought I saw something strange in front of me. I did a quick 360-degree turn to check what it was, but where was it now? And how much did I turn? I didn’t remember and now I didn’t know where I was. I didn’t do a written flight plan as the flight was so simple and straight forward, but now I had lost my bearings and cannot remember my track. I was lost and couldn’t distinguish any natural features on the ground that would be on my WAC map. And as I did not check my fuel thoroughly on departure I was now low on fuel. I noticed agricultural crops here and there, indicating that I was near Kununurra, but where? I couldn’t wait too long as I was low on fuel, so I switched on the emergency frequency 126.5 and radioed a mayday distress signal. Fortunately I didn’t have to wait too long. Mike from the Sinclair workshop in Kununurra picked up the signal and advised me that he was flying over in a light plane to help me. He soon appeared and I was relieved, but what were we going to do as I was low on fuel? By radio contact he told me that he would fly ahead and find a suitable landing area, but what on earth would he find? The Kimberley is just all rocky terrain with no place to land, except the roads, which would be OK for an emergency landing. And yes, that is exactly what we found. West of the Durack River, a dirt road was being constructed, but it had people working on it. As we had no time to waste and there was no alternative, we would have to swoop a few metres above the road, frighten the workers, all hell would break out and they would run for cover and for their lives into the bushes. Sorry mates, there is no other way. Mike lands first and I follow suit. I am on the ground, safe. What a relief. Time to explain to all the workers and thank God they were not angry. They understand the situation and what a bonus—they offer me some fuel. What a blessing! Mike gives me the proper track directions for Kununurra and after thanking the workers, we flew off and in just a few minutes we landed safely in Kununurra. I was safe, rescued and it was time to thank Mike for his great help. But what a lesson! Do not approximate your checks. Always do a thorough probe. Write down your flight plan with your track directions. Never again will I ever enter a life-threatening situation due to my own doing. Published previously in the Sports Aviation 2018 Close Calls booklet. This is a joke right? That was like reading something from a fairytale kids book!!! This guy was signed off as competent? My God, I’ve always said it’s way to easy to get a plane ticket, way too easy! Glad he survived that but would you put someone dear to you up in a plane with this guy? I have to agree with Walter. This man should sell his Skyfox and buy a new car – he’s clearly not qualified to be in control of an aircraft. Clearly this guy is not about to stop flying. Good on him for sharing his experience. Suggest Flight Safety Australia immediately send him a copy of your new Safety behaviours human factors: Resource guide for pilots. Maybe send a copy to each to Walter & Rob. I’m halfway through my copy and find it compelling reading. Hmmm . . . perhaps I was a little hasty in my criticism of the pilot. Based on his poor planning/decision making and all round lack of basic aeronautical skills (unsure of fuel level, forgot the track(? ), assumes an airport 60 miles away will have the same wind direction as his departure airport, for a straight in approach) maybe it’s the man who signed him out with “all his endorsements and full pilots licence” who should be copping the flak. Rob if it where plausible you’d be right there in your thinking but the whole story is ridiculous. Most of it doesn’t make sense, written by a five year old! The grammar is poor, I shake my head at anyone who believes this as there’s so many dumb comments! Hmmm, given the timing, the first thing I thought was “April Fool’s Joke”….. I was thinking it was April fools too… For a start Kununurra is north of Wyndham… And the emergency frequency? Fuel from some random road workers? Goes on and on. The “emergency” frequency is a bit odd – never heard of that one – and it was picked up by a guy in a workshop in Kununurra who “flew out and found him”- and how long did that take while he was presumably flying in circles and running out of fuel? I’m also coming around to the idea that he’s having a lend of us. No doubt the anonymous author is reading this so perhaps he (or she!) could post a comment and put us all out of our misery. I’m with Walter: this is some kind of a joke, the story is so full of nonsense (to add to the list, how can you be following a highway, do a 360, and not see the highway again?). I reckon the author, who is obviously not a pilot (if he was he would not feel the need to define a “straight in approach” for the readers of Flight Safety (and who says “WAC map”? )), made a bet with his mates that he could get an article into Flight Safety. Allan most of us knew it was sus, some sadly are clueless and fell for it (Simon) but what’s probably more surprising is that it’s obvious no one vets these stories before they get listed? Flying is fun, it’s also a serious business especially when undertaken commercially but every now and then some people totally unsuitable to command an A/C slip thru the net, trouble is the net is very weak!